Chicago is a city that is located in the state of Illinois in the United States of America. Chicago is in the Midwest region of the country and sits on the southwestern shores of Lake Michigan. Lake Michigan is one of the Great Lakes. 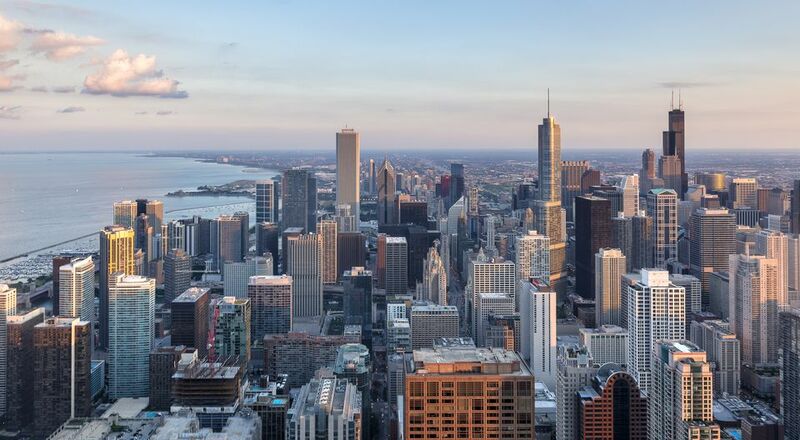 Chicago has the third highest population of all of all the cities in the United States. With nearly 3 million people, it has the highest population of all the cities in the state of Illinois and the Midwestern United States. The Chicago metropolitan area -- often called Chicagoland -- has nearly 10 million people. Chicago was incorporated as a city in 1837 and its population grew rapidly in the mid-nineteenth century. The city is an international hub for finance, commerce, industry, technology, telecommunications, and transportation. Chicago's O'Hare International Airport is the second-busiest airport in the world when measured by aircraft traffic. Chicago has the third-largest gross metropolitan product in the United States— about $630.3 billion according to 2014–2016 estimates. The city has one of the world's largest and most diversified economies with no single industry employing more than 14 percent of the workforce. The main possibility to explain the city's longstanding nickname is, of course, the weather. An explanation for Chicago being a naturally breezy area is that it is on the shores of Lake Michigan. Frigid breezes blow off Lake Michigan and sweep through the city’s streets. Chicago's wind is often called "The Hawk." However, another popular theory exists is that "Windy City" came to be in reference to Chicago’s overly chatty residents and politicians, who were deemed to be “full of hot air.” Proponents of the “windbag” view usually cite an 1890 article by New York Sun newspaper editor Charles Dana. At the time, Chicago was competing with New York to host the 1893 World’s Fair (Chicago eventually won), and Dana is said to have cautioned his readers to ignore the “nonsensical claims of that windy city.” Many now dismiss that rationale as a myth. Researcher Barry Popik has uncovered evidence that the name was already well established in print by the 1870s — several years before Dana. Popik also dug up references showing that it functioned as both a literal reference to Chicago’s windy weather and a metaphorical jab at its supposedly boastful citizens. Since Chicago had previously used its lake breezes to promote itself as a summertime vacation spot, Popik and others conclude that the “Windy City” name may have started as a reference to weather and then taken on a double meaning as the city’s profile rose in the late-19th century. Interestingly, although Chicago may have gotten its nickname in part because of its fierce winds, it’s not the breeziest town in the United States. In fact, meteorological surveys have often rated the likes of Boston, New York, and San Francisco as having higher average wind speeds.